"Self Addressed Stylistic Experiment" was created for my 2009 solo show at Space Gallery in San Francisco. 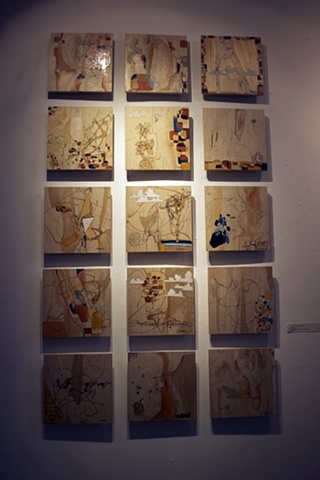 With it, I refined and developed my "archetoonistic" lexicon with the mixed media techniques of the Breaking Spaces work, and also continued my experiments with the "set series" concept first designed in the Fresh Paint work from 2005. At the opening, my friends got drunk and started narrating the different panels and creating histories from their discreet chapters. Fascinated, I encouraged them. Pretty soon we were shuffling the panels around on the grid in order to best complement the shifting tides of the story. Everything from string theory to mesopotamian battle strategy was brought up. I have cool friends.